Braun vs Philips Norelco vs Panasonic: Which One Has The Best Automatic Cleaning Station? Regardless of your stance on the electric vs traditional shaving debate, there’s no denying that electric shavers are very practical. There’s something very appealing about being able to simply grab your razor and start shaving, particularly when compared to the lengthy prep work implied by traditional shaving. And it’s not just the preparation and the actual shaving; cleaning and drying your gear can be tedious and repetitive. 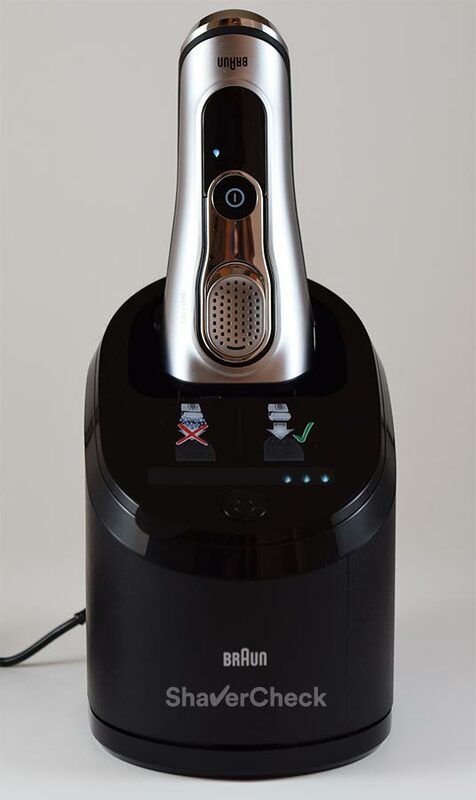 While most electric shavers are easy to clean manually, an automatic cleaning station is the ultimate step in ensuring a completely fuss-free shaving experience. All the major manufacturers offer variations of their shavers that include an automatic cleaning station. And while the end goal is the same — charging, cleaning, drying and lubricating the shaver — they can be very different in many ways. For example, the cost of the cleaning cartridges, how well the stations perform, how long the cleaning and drying cycles take to complete — these are all things that should be considered by the potential buyer. In this post we’ll examine some of the best automatic cleaning stations from Braun, Philips Norelco, and Panasonic, see how they stack against each other for the most important aspects and ultimately find out if they are worth buying. Should you get a cleaning station? Which one? 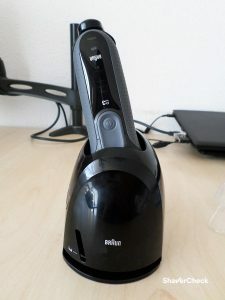 Braun, one of the most popular manufacturers of electric shavers, offers the option of an automatic cleaning station for all their electric shavers. These include the Series 3, Series 5, Series 7 and the flagship Series 9. 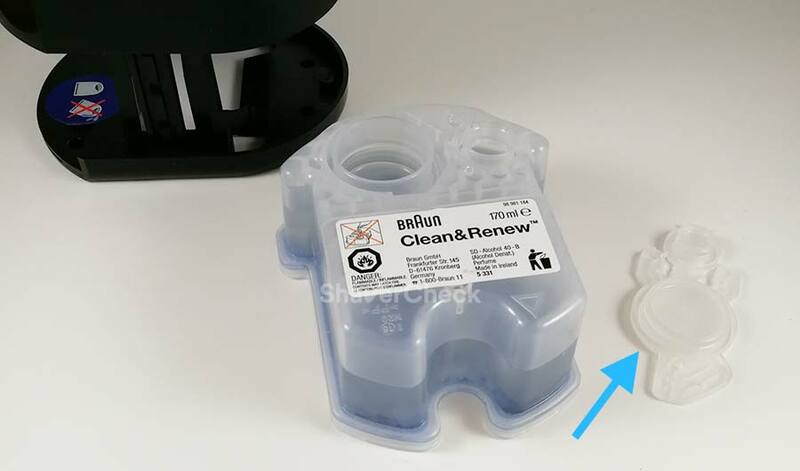 The models that include the cleaning station usually have a CC (standing for Clean & Charge) in the product name. For example, 3050cc, 5090cc, 7865cc, 9290cc etc. The s (solo) models don’t come with a cleaning station and except for the Series 7, they will not work with one. The Series 7 s models (like the 740s, 7893s etc) are the only ones fitted with the chip needed to communicate with the station. In the case of the other lines — the Series 3, 5 and 9 — only the cc models come with this chip and will work with a compatible cleaning base. All the stations, regardless if they come with an entry-level Series 3 or a high-end Series 9, use the same cleaning cartridges. The cleaning solution is alcohol based and Braun is as far as I know the only manufacturer that uses alcohol; all the other ones use a detergent based cleaning solution. Choosing alcohol has both advantages and disadvantages. Alcohol is very efficient at cleaning and also dries very fast. On the other, alcohol also evaporates very fast and is flammable, so there may be shipping or traveling restrictions because of it. Even though all the clean & charge stations across Braun’s lines of electric shavers use the same cartridges, they can be different in the way they work. For example, the Series 3 uses a more basic variant that has been stripped off of several features, like the LED indicators, cleaning modes or the option to just charge the razor without cleaning it. The cleaning station of the Series 3 is also more compact compared to the ones included with the Series 5, 7 or 9. 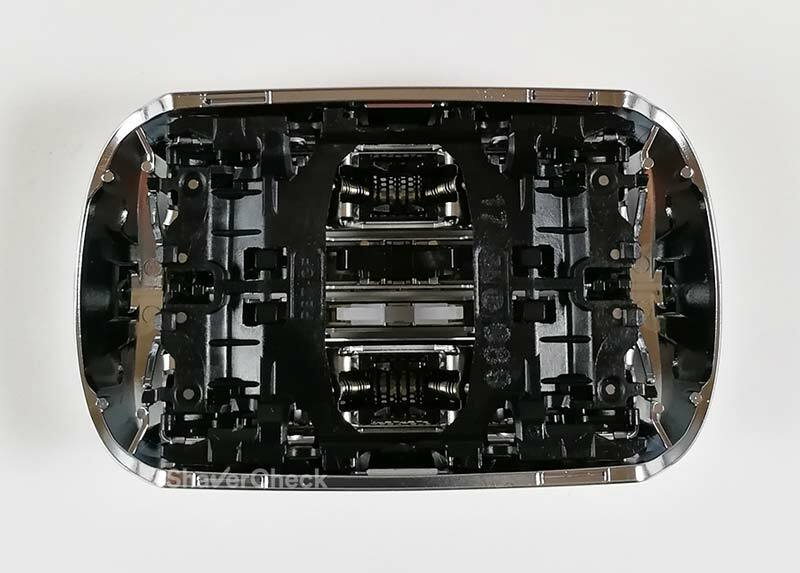 The size and shape of the opening, along with how the shaver is connected to the station via two metal plates differs throughout the different series, so you won’t be able to use your Series 7 station with a Series 9 shaver for example or vice-versa. Another difference among the Braun stations is how they dry your shaver. For example, the stations that come with the Series 7 (older models) and 9 use either induction heating or a fan respectively to speed up the drying process, while the ones included with the Series 3 and 5 don’t use any active system to dry the shaver. Important: the stations included with newer Series 7 models (7865cc, 7899cc, 7898cc, 790cc etc.) lack the induction heating mechanism, as well as the quick clean setting. Braun stopped manufacturing that particular station and all current Series 7 models will come with the updated station that doesn’t have an active drying system. The Series 7 updated station, pictured here with the 7865cc. As a result, the drying cycle for the Series 3, 5 and the above mentioned Series 7 models takes a lot longer as the alcohol-based solution will have to evaporate naturally. On average it takes 3 to 4 hours to have a completely dry shaver. This isn’t a deal breaker as most of us won’t need to shave within hours of a previous shave and you can simply leave the razor in the station. Regarding the use of inductive heat vs fan, both implementations have pros and cons. Using a fan produces some noise and also takes a bit more time. For example, a complete cleaning and drying cycle on the Series 7 station that uses induction heat takes 30 to 40 minutes, while in the case of the Series 9 it takes in excess of 45 minutes. The Series 9 9290cc Silver during the automatic cleaning cycle. The fan does seem to dry it completely compared to induction heat that tends to sometimes leave the shaving head damp. Using inductive heat is completely silent and takes less time, but Braun ditched it in favor of using a fan for the latest Series 9 shavers. The better drying achieved by a fan and possibly the lower production costs are the main reasons for this change. Braun’s automatic stations clean, charge, dry (Series 9) and lubricate the shaver and do so very well. You can’t however choose just to dry your shaver (you can do that with Panasonic stations though). The cleaning and drying cycles are reasonably short and quiet, even for the stations that use a fan. The cleaning cycle takes around 2 to 5 minutes, while the drying phase lasts up to one hour, depending on what technology it’s being used (inductive heat or fan). Some shavers in the Series 5 and 7 families include a more basic version of the cleaning station, lacking a few features. For example, only the Series 5 5090cc comes with the full option station while the other 50** models (like the 5070cc) lack the cleaning modes (short, normal, high intensity) and the hygiene analysis. The newer 51** models do come with the same station as the 5090cc that includes the above mentioned features. The same goes for the Series 7 760cc variation that doesn’t include the quick clean mode and hygiene indicator like the rest of the Series 7 shavers. Despite these differences, the end result after the cleaning is excellent. 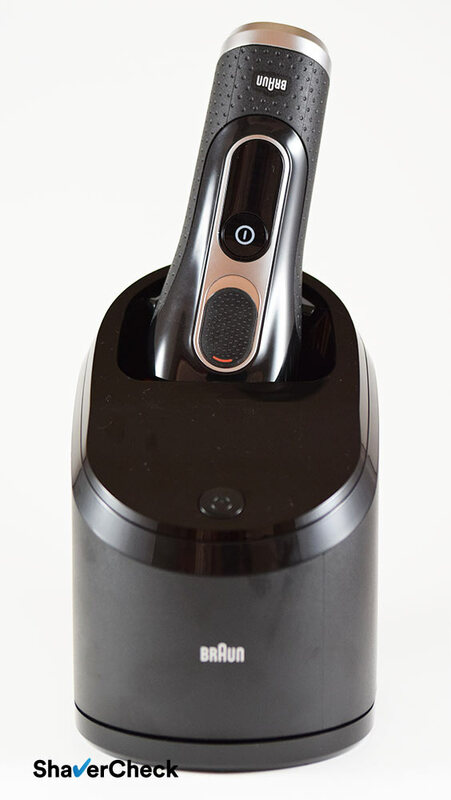 The shaver is perfectly clean and lubricated, ready for your next shave. And it has a nice, citrusy scent. As for the downsides, since the solution is alcohol based, it tends to evaporate fast. It is therefore a good idea to remove the cartridge from the base and put the cap back on if you won’t be using it for a few days. Also, there’s a caveat if you’ll be using your shaver with shaving cream or gel. Precisely, you’ll have to manually clean all the foam and soap from the shaver before using the station. If you fail to do this the station and the fine mesh filter inside the cartridge can eventually clog. 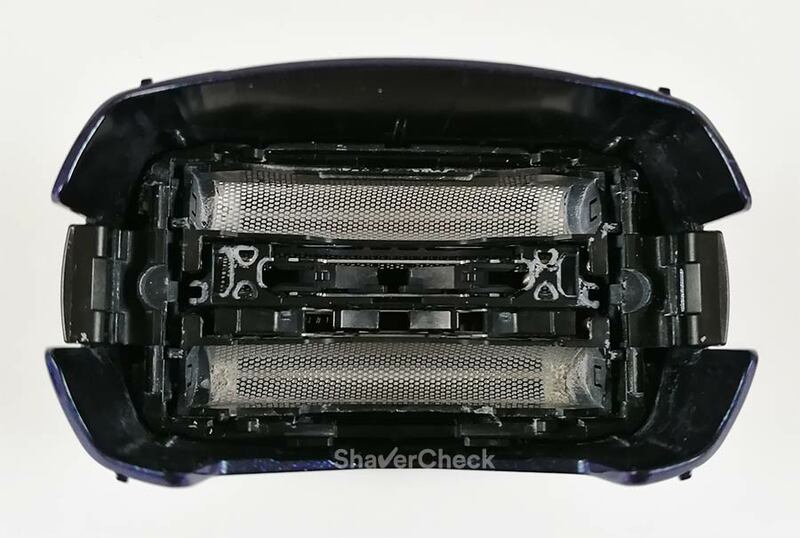 It’s pretty obvious why this is a bit inconvenient for anyone planning to buy a wet/dry shaver like the Series 7 7865cc or the Series 9 9290cc and using it with shaving cream or gel. For dry shaving, this is a non-issue, but if you plan on using shaving cream I highly recommend you to consider other options from Panasonic or Philips Norelco as their stations are less susceptible to this problem and the shavers themselves perform better when used with shaving cream or gel. Finally, because the cleaning solution contains alcohol, the paint just below the shaving head can start to chip and flake after years of using the station. The problem was notorious with the Series 7 and we’re yet to see if it’s still present in the case of the Series 5 and 9. Braun says that the cc models have a coat of special paint that should withstand the exposure to alcohol, but still some users have reported issues. However, the damage is only aesthetic and won’t affect the performance of the shaver. Another very important thing to factor in when looking at various cleaning stations is how much money you’ll be spending on replacement cartridges. While the performance of the Braun station is very good, the costs are higher compared to Panasonic and Philips Norelco. The cartridges are priced similarly, maybe a bit pricier, but they don’t last as long. Depending on how often you use the station, one cartridge can last between one and several months. You can prolong the time between changing the cartridges significantly by avoiding the evaporation of the fluid (putting the cap back on), using it once or twice per week and by brushing the excess hairs and dirt from the shaving head before you use the station. There are also third-party alternatives that work really well and cost less money. 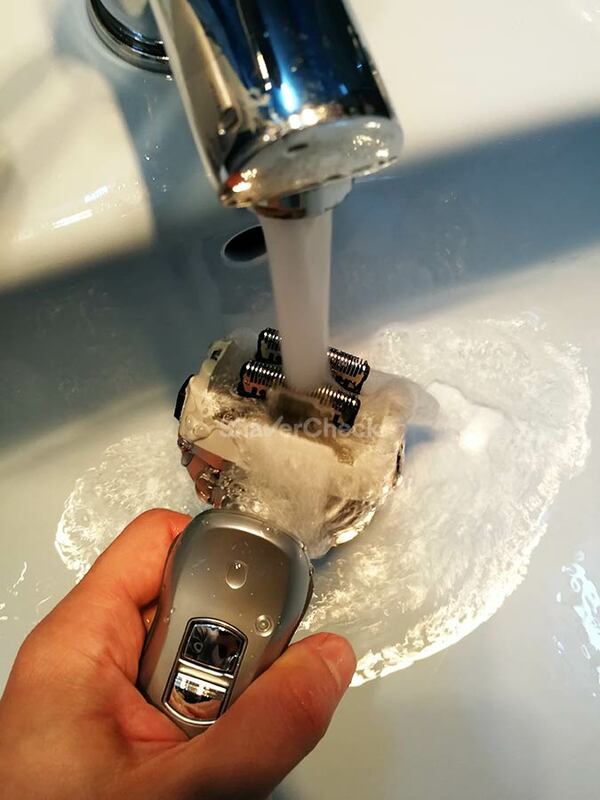 This is an ideal compromise between costs and maintaining a proper hygiene of your Braun shaver. I usually don’t recommend cleaning stations if they’re not absolutely necessary, but in the case of Braun shavers, they are. The shaving heads are can be difficult to clean manually because the blades and foils are merged into a single piece, called a cassette. Panasonic for example uses separate blades and foils, making cleaning a breeze. The very intricate inner part of the Braun Series 9 shaving head makes it difficult to clean manually. It’s the same story with the Series 7 and 5 as well. 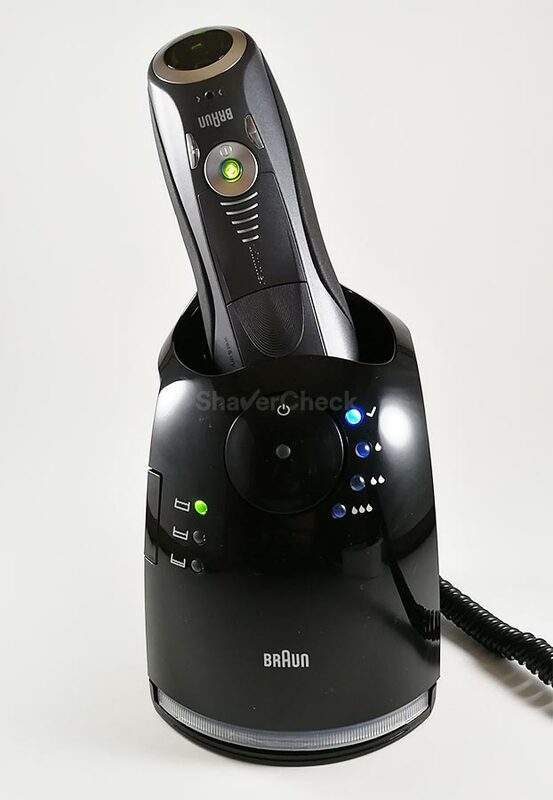 Even if you won’t be using the station after every shave, my recommendation is to buy a Braun shaver that includes one, especially in the case of the Series 5, 7 or 9 (you can probably skip it for the Series 3). You can find third-party cleaning solutions that are very cheap and work just as well. You can’t just dry the shaver as you can with Panasonic stations. The SmartClean stations from Philips Norelco replace the older JetClean systems that used to be included with older (and discontinued) razors, like the 1280x. The SmartClean cleaning systems are included with Philips Norelco shavers from the Series 5000, 7000, 8000 and 9000. Most of them can be bought with or without the station. You can also buy the station separately later on if you choose so. Unlike the older station that needed to be refilled with Norelco’s cleaning solution, the new station uses cleaning cartridges. The model numbers are JC302 (pack of two) and JC303 (pack of three). The new stations are also more compact and take less countertop real estate. 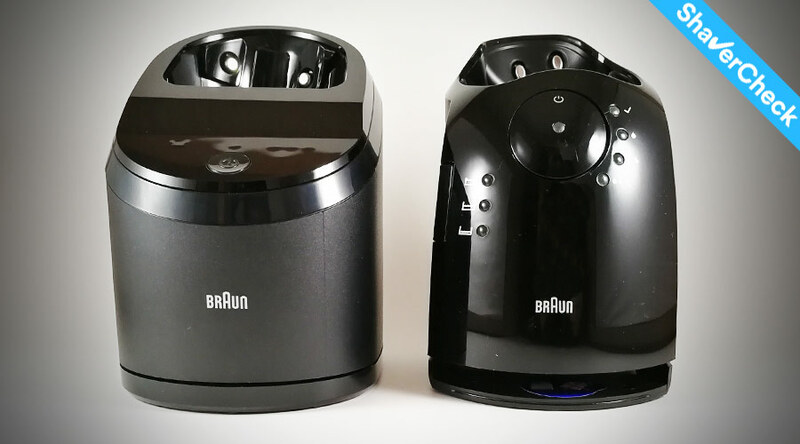 The cleaning solution is detergent based and as a result, it won’t suffer from the evaporation problem we saw with the cartridges from Braun. The SmartClean stations perform the same task of cleaning, charging, drying and lubricating your Philips Norelco razor. Using and operating the station is extremely simple, as you’ll only have to place your shaver into the holder and press a button. Once the ON/OFF button of the station is pressed, it will begin the cleaning cycle. At around 13 minutes, it takes longer compared to Braun’s Clean & Charge station, but it’s still reasonably short and also quieter. Once the cleaning has ended, the station will begin the drying cycle. For this it uses inductive heating and the process is completely silent. 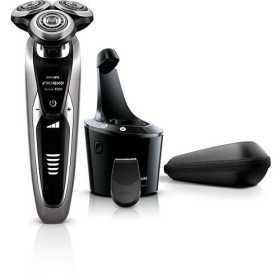 According to Philips, drying the shaver takes a hefty four hours, a whole lot more compared to Braun. In practice, the shaving head of my razor was always perfectly dry after around 2 hours. The result of the cleaning process is excellent, the shaver being perfectly clean, dry and lubricated. The SmartClean system takes the lead in front of Braun’s CC station for wet shaving: you can use shaving cream or gel without worrying about any potential damage to the station. As we saw previously, with Braun you’ll have to manually clean the razor of any lather residues before using the station. The shaver must also be completely dry. With the SmartClean station you only have to quickly rinse the outside of the shaving head under tap water and then you can toss it into the cleaning base. One thing I do not like about Norelco’s cleaning cartridges is that they do not have a plastic cap. They only have a sticker that you peel off and that’s it. If for example you must take out the cartridge and take it with you on a trip, you’re completely out of luck. Same goes if you want to use the station less often, even though in this case you could use some duct tape to cover the holes and slow down the evaporation of the fluid. Probably the best thing about the cleaning stations from Norelco is the low cost of ownership. The price of the cartridges is on par with the other offerings, but they somehow last a lot longer before needing to be replaced. Depending on how often you use the station, you can easily squeeze 3 months out of a cleaning cartridge. Moreover, since the solution doesn’t contain alcohol, it won’t evaporate as fast and there are no restrictions on storage or shipping. 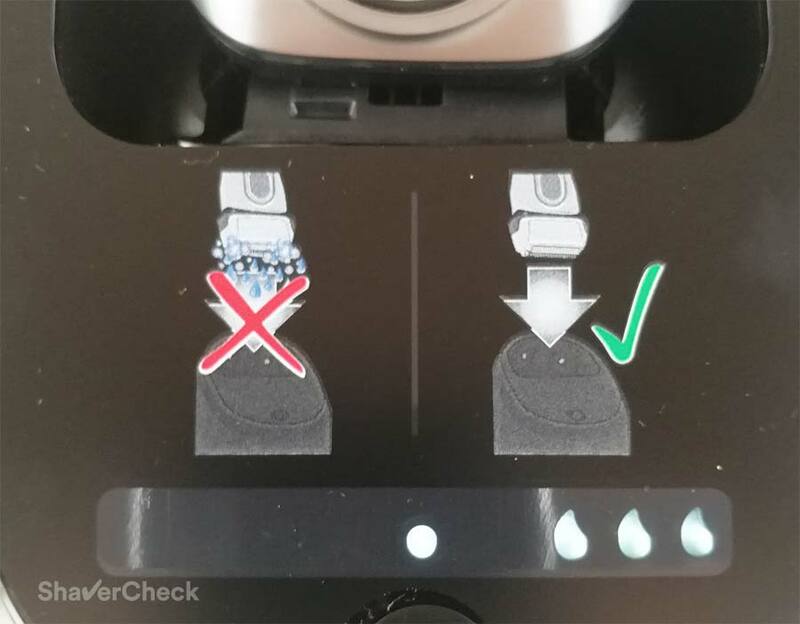 If we consider the performance and the low cost per cleaning cycle then I would say yes, it’s worth buying a Norelco shaver that comes with the SmartClean station. I would definitely consider it in the case of more advanced shavers like the Norelco 8900 or the 9300/9700. As for the more affordable Series 5000 or 7000, if it fits within your budget, go for it. A quick manual clean of a Norelco shaver is easy to perform, but a more thorough cleaning that requires taking apart the shaving head completely and cleaning each individual cutter is fiddly and time-consuming. This is where the station can come in very handy and take care of all the cleaning. The protruding shaver holder makes them difficult to pack. Completing the trio is Panasonic, another major manufacturer of electric shavers and self-cleaning stations. The older Vortex Hydra Clean Shaving Systems that use detergent cartridges. 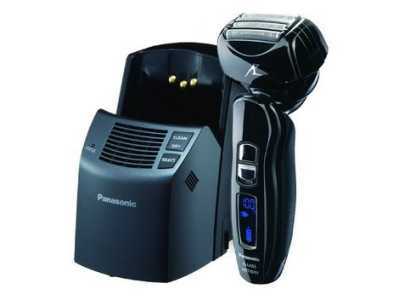 These stations are included with the Arc 4 line (the Panasonic ES-LA93-K model), several older Arc 3 shavers (Panasonic ES-LT71-S) and the first generation Arc 5 shavers (Panasonic ES-LV81-K). The new so-called Premium Automatic Clean and Charge Station available with the newer shavers. These include the new Arc 3 LT series (ES-LT7N-S) and the second and third generation Arc 5 shavers (ES-LV95-S, ES-LV9N-S etc.). The same station is available with the latest revision C/D Arc 5, but the part number is different. There are similarities, but also a few important differences between the two self-cleaning systems from Panasonic. They both use detergent for cleaning the shavers, just like the SmartClean stations from Philips Norelco. 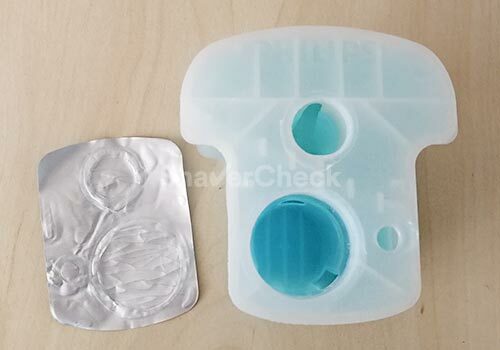 However, the older Vortex Hydra Clean systems use detergent cartridges, while the newer stations use detergent gel that comes in small sachets. You’ll have to mix the concentrated detergent with water in the filter tray yourself in the case of the latter. The older stations are also larger and in my opinion look a bit dated. Leaking was another potential problem with the older system that was completely addressed with the new iteration. All Panasonic cleaning stations use a fan for the drying cycle; the one in the newer stations seems subjectively quieter when running. 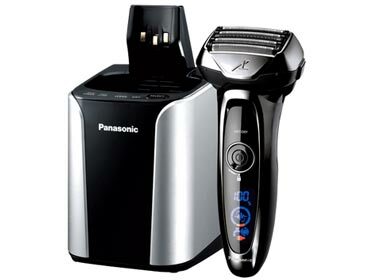 A Panasonic cleaning station will charge, clean, dry and lubricate the shaver. As expected, they perform really well, on par with Braun and Norelco. A unique feature specific to Panasonic stations is the dry only setting. Precisely, you can clean the shaver manually, then dump it into the station to dry it. You cannot do this with the cleaning stations from other brands. A cleaning cycle takes approximately 10 minutes, while the drying phase can last anywhere from one up to three hours depending on the ambient temperature. However, most of the time it will take just a little over an hour. In this regard the Panasonic cleaning stations fare better than the SmartClean systems from Norelco but not as good Braun’s stations which are the fastest, particularly the ones that use induction heating. The cleaning and drying cycles are also reasonably quiet, the newer stations being an improvement in this regard. As it was the case with Norelco’s SmartClean system, you can use the Panasonic cleaning station with no restrictions when it comes to wet shaving. You can shave with your Panasonic razor using your favorite shaving cream or soap then toss it into the station for a thorough cleaning without worrying that the lather might damage the station. It is however recommended to give it a quick rinse under tap water beforehand. Regardless of the generation, the costs associated with using a Panasonic cleaning station are very reasonable. The reasons are the same as in the case of Norelco’s SmartClean system. The cartridges (used by the old Vortex Hydra) and detergent sachets (used by the new stations) from Panasonic are usually cheaper to buy compared to Braun’s cleaning cartridges. Moreover, they last longer. Depending on how you use your shaver, you may need to replace them every two to three months. Since they don’t contain alcohol, you won’t have to worry about evaporation either. You can extend the time by manually cleaning you Panasonic shaver and only using the station once a week for example. Which leads us to the next question. Out of the three big players in the electric shavers market, Panasonic cleaning stations are the least necessary. And that’s a paradox since the stations are quite good as we’ve seen. However, out of all electric shavers, the ones from Panasonic are the easiest to clean manually. It literally takes less than a minute to clean a Panasonic shaver thoroughly with a bit of liquid soap and warm tap water. The design of the shaving head, with the inner blades separated from the foils, makes cleaning a breeze. The construction of the shaving head allows excellent access for easy cleaning. Finally, all Panasonic shavers, even the entry-level Arc 3 models have a so-called sonic cleaning mode. When activated, it makes the blades vibrate extremely fast, dislodging any dried lather, debris or dirt. As a result, I personally haven’t used my Panasonic cleaning stations in years. So my take on this matter is to only buy a Panasonic shaver that includes a cleaning station if you can get a fantastic deal on it. Otherwise just save some money and buy one without the station. For example, I wouldn’t get one with an Arc 3, even if it’s the new LT line that has the updated cleaning system. The Arc 3 is a budget oriented line and the models that come with an automatic cleaning station cost significantly more than the ones that don’t. 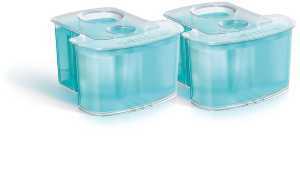 The same goes for the Arc 4 and the original Arc 5 shavers that have the older Vortex Hydra Clean Shaving Systems and use the detergent cartridges. For the second and third generation Arc 5 shavers, like the the ES-LV95-S and ES-LV9N-S respectively, I guess you can treat yourself with the automatic station if it fits within your budget. The detergent-based solution lasts longer compared to Braun’s cleaning cartridges. The stations aren’t really necessary since you can easily clean the shavers yourself. Now that we’ve reached the final part of our analysis of the best self-cleaning stations, it’s time to put it all together in an actionable manner. Is the shaver easy to clean manually? If so, do you really need the station? How much will the cleaning cartridges/detergents increase your monthly costs? Are the cartridges/detergents readily available? With that in mind, here’s my personal take on the matter for each of the three big names in the industry. If you decide to buy a Braun electric shaver, then the cleaning station is a necessary evil. The shavers can be difficult to clean manually and the stations, while not the most cost-effective, work excellent. I think I would skip it for the Series 3, but in the case of a Series 5, 7 or 9 I would most likely opt for a model that includes the cleaning station. Using a cheap third-party solution will also lower your costs significantly. The SmartClean stations are excellent as they offer the lowest cost per cleaning (in the case of the OEM solution) and work great. Would I get one? Probably yes, especially in the case of mid-range and high-end shavers like the Norelco 8900 or 9300. A quick manual clean of a rotary shaver is easy to do, but an extra-thorough cleaning that must be performed every once in a while is time-consuming and fiddly. For this reason opting for a cleaning station is probably a good call. I’ve said it on many occasions, in the case of all Panasonic shavers, a cleaning station is not necessary. I would probably get one only if the price difference compared to the same model that doesn’t include the station would be insignificant. Again, the automatic stations from Panasonic are excellent and offer very good performance and value for money, but you don’t really need them as the shavers are extremely easy to clean manually. Home » Articles & Guides » Guides » Braun vs Philips Norelco vs Panasonic: Which One Has The Best Automatic Cleaning Station? I would add that you can close the Braun reservoir with a plastic lid. (in case of traveling). For the Philips I disliked the odor of the cleaning fluid. To me it smells like a cheap after shave…… he Brauns’s is of course on an alcohol base but at the end much more neutral. Thank you for sharing your experience. The SmartClean fluid never bothered me in this regard but then again I’m not too picky. As long as the scent of the shaver says clean to me, be it soapy, citrusy or spicy, I’m good. 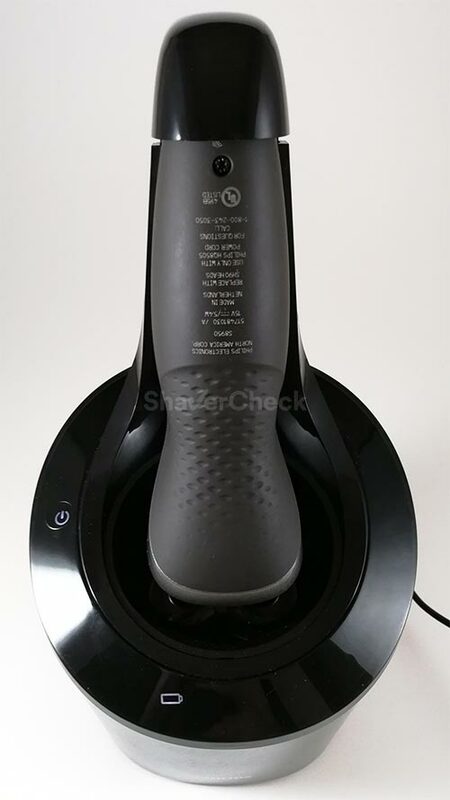 You are spot on with the orientation of the shaver when placed into the station; the back of Philips shavers is not particularly pretty either. Just ordered a Braun 9290cc, the one with the cleaning station, based on your excellent detailed review. I was using an older model marked 8975, which I think was a German model series 5; it still worked but technology has moved onwards.. Does anyone know what this ‘New Formulae’ consists of, and is the change an improvement.?? The older Braun cartridges still seem to be available also..
Any input would be much appreciated.. Thanks for what you do… AND Best Wishes for the New Year.. Thank you for your kind comment. I am yet to try the new cartridges, but I highly doubt that the cleaning fluid is vastly different compared to the current one. It’s still alcohol based, but maybe with a different fragrance or some other minor changes. You can safely use either one as long as it’s a genuine Braun product. Hey I’d just like to add that the Philips SmartClean system is notoriously difficult to get, if you bought a shaver without it. Philips don’t sell it as a seperate produkt and even contacting them can be a mess. At least this is how it is in Denmark. I have even tried contacted them and that didnt help. The only place I found it was in the international version of amazone. If ylu know of any other place or solution I’d like to hear it. Thank you for your comment. That is correct, the options are limited if you have to buy a Philips cleaning station separately. 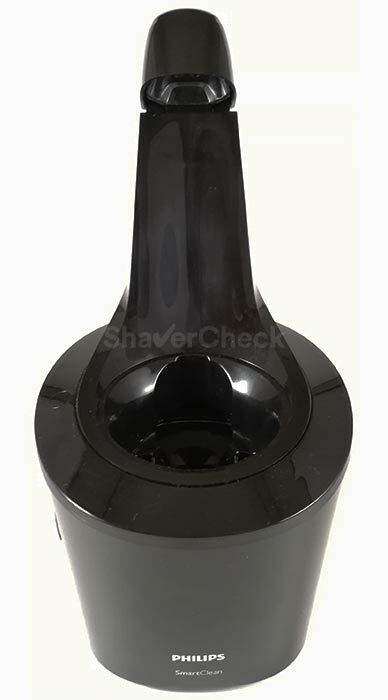 You can check out shavers.co.uk, they also sell different parts and accessories for electric shavers. It’s a whole different story with Braun for example as their stations — even the older discontinued models — can still be bought from various sites. I have leftover Norelco solution from when I changed to from a Norelco to a Braun. When my Braun tells me it is time to change, can I empty out my dirty Braun solution pour in the unused Norelco solution? Absolutely not. Norelco’s solution is detergent based, while Braun cc stations are designed to work with alcohol solutions. The station may even (falsely) read the cartridge as being empty (based on the conductivity of the fluid). So i just refilled my Norelco station for the first time and accidentally bought Braun solution. So my question is the same as Dan’s but reversed. Just wondering if using the alcohol solution will cause damage to Norelco the station. Not worried about the false refill read cause unfortunately it already does that even with the correct solution. Dustin, I would strongly advise against using the Braun solution. 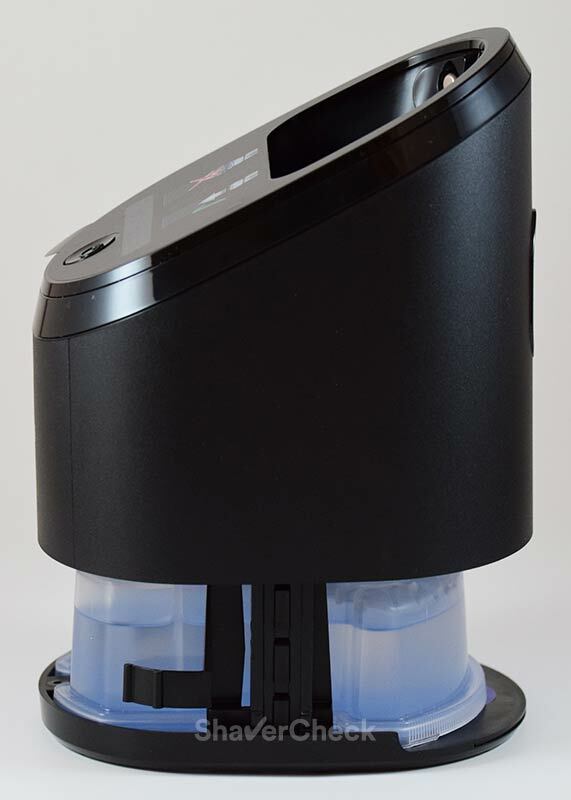 Norelco shavers and stations are designed to work with a detergent-based solution. 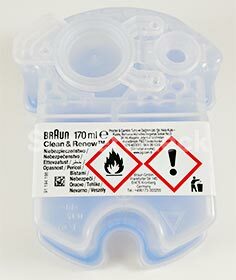 Braun’s cleaning fluid contains alcohol (isopropyl or ethanol) and the parts that come into contact with it, including rubber gaskets in the station or plastic parts that were not designed to withstand constant exposure to alcohol, may deteriorate in time. First of all, thank you for your thorough write-ups. I currently have the Norelco 9300 and have been considering replacing it with the Braun 9290 (the 9300 just doesn’t work for me like prior Norelco razors). Hopefully you can clear something up for me. Does the regular use of a cleaning station prematurely wear out the cutting cartridge/heads? Today, I use the Norelco cleaning station once a week for fear of wearing out the cutters. If I do switch to the Braun 9290, should I stay with that practice, or is using the cleaning station daily ok? Many thanks for your comment, I really appreciate it! Regarding your question, using a cleaning station after every use will not lead to a premature wear of the cutting heads. On the contrary, what usually contributes to that is improper cleaning and lubrication and an automatic cleaning station takes care of both extremely well. I’m thinking of trying a Braun after years with a Panasonic, because the Braun’s fluid is alcohol based, and because my Panasonic’s cleaning station was very unreliable. First, it would constantly blink as it should with an inserted shaver that’s fully charged – even with the shaver removed. When it did this (eventually every time the shaver was removed) the only way to get the cleaning cycle to work was to unplug and re-plug it. I contacted Panasonic and they said this was a known problem that was designed out of the new units. Secondly, the cleaning system eventually developed a horrible smell of mildew. As there is no safe way to clean the station, and the solution is water and not alcohol based, once this started I was unable to clean it. So I threw it out. Long story short, do you think these problems would be avoided with the Braun? Thank you for your comment. Unless you receive a faulty cleaning station, you won’t have to worry about the first problem if you decide to get a Braun shaver. I personally haven’t experienced it with any of my shavers and I am not aware of anything similar affecting Braun’s cleaning stations. The second one is less likely to happen since the solution is alcohol-based and contained in a cartridge that you’ll be throwing away. The cleaning base may clog with hairs and dirt after many uses. However, a very basic cleaning every once in a while (wiping the inner housing with a soft cloth and using something like a toothpick to clear a potentially clogged drain) should be enough to avoid any clogging and nasty smells. No, none of these stations will work with a Yohoolyo shaver. Used your site to pick my new Panasonic ES-LV95-S shaver (with cleaning station) to replace my old Norelco 1280. Great articles and advice, led to a great choice. I guess I should round out the questions on using different cleaning solutions. I have some extra Norelco cleaning fluid. Can that be used in my Panasonic cleaning station? I think they are both detergent based. Yes, both solutions are detergent based. I never used Norelco cleaning fluid with a Panasonic station, but I guess it should work. I bought Braun 7893 without station. Do you think that ultrasonic jewellery cleaner, will do the same job as Braun c&c? Never actually thought about using an ultrasonic cleaner, to be honest. But I have my doubts about its efficiency and safety in the long run. Personally, I would invest in the convenience of a Series 7 cleaning station, they can be bought separately for a pretty reasonable price and there are very cheap third-party cleaning solutions available.